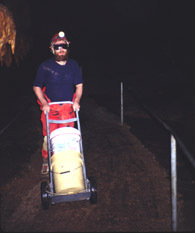 Cave Conservation has become a more important caving activity in the last few years. Ideally, conservation means preventing damage to the cave before it happens. In the case of some caves, this is simply not possible; the damage was done years ago by unthinking people who never realized what their impact upon the cave would be. It is to try to undo this damage that our efforts at cave cleanup and restoration focus on. Cave Cleanup is basically the same thing your Mom wanted to you to do to your bedroom. Pick up the junk that didn't belong there. Some cave debris, brought in naturally by animals or flood, is basically good. Human made trash and items aren't. 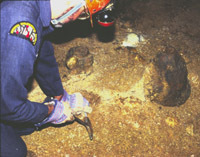 Cave cleanup often consists of hauling out metal, plastic, cans, clothing, cans and glass in trash bags. Sometimes larger things, like mattresses, car bodies, old washing machines and refrigerators end up down sinkholes, and these, too, have to removed. Wood, and other biodegradable debris, especially if it has been in the cave for a long time, cause much concern. Many animals live in and eat such things, and wholesale removal can disturb whole populations. In such cases, much thought must go into what to do. Smoked and painted on graffiti is also a cleanup problem with its pros and cons. While no one argues that "John Loves Sally--1990" has any significance except proof of cave vandalism, earlier work may have historical significance. Prehistoric cave art or authentic signatures of famous people may have value. Signing a cave as evidence of exploration or visit was acceptable up to the the 1950's and important data can be found from examination of such things. As a rule, graffiti should only be removed after photographs are taken of anything deemed possibly significant, and after consulting with the landowner and someone knowledgeable about the history of the cave. Youth groups have removed 10,000 year old rock art, and signatures of American presidents have vanished after enthusiastic cleanup trips. Restoration is slightly different from cleanup. Just eliminating human interference won't do. Restoration is the effort to put things back the way they were before they were damaged by people. Gluing and reattaching cave deposits, carefully removing concrete or artificial structures designed to be permanent, smoothing mud banks, cleaning mud from speleothems, and restoring natural water flow are among some of the aspects of cave restoration. Restoration is equal parts technology and art--the trick is to do the job so well than no one notices. Ingenuity and patience are key ingredients in cave restoration--participants need to use materials and techniques which are effective, but do not adversely harm the cave. Paint thinner may be the most effective way to get off spraypaint, for example, but using thinner can be harmful to cave life, and is not recommended. Some cleanup and restoration efforts don't take place in the cave at all. Sometimes, changing land use in the watershed of a cave can have a restorative effort on the cave, such as at Hidden River Cave in Horse Cave, Kentucky. There, by improving sewage and industrial waste disposal, the cave has begun the long journey back to viability. Every cave region is different when it comes to cleanups and restoration, because caves across the world vary widely in their characteristics. 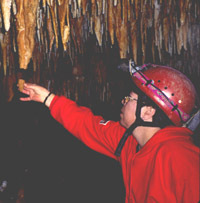 Local grottos often sponsor cave cleanups, and restorations as part of their focus on conservation. For national information on cave cleanup, restoration, and conservation, contact the NSS Cave Conservation Section.